Cincinnati, also known as the Queen City, is a city rich in history and culture with exceptional visual and creative arts, professional sports teams and top notch museums. Whether you are a resident or a visitor there is always something to learn, see and do in Cincinnati and our neighboring cities of Covington and Newport. For those reasons and many more, it’s no surprise that in 2012 Lonely Planet Travel Guide named Cincinnati number three of the top ten travel destinations in the United States. The influence of the German settlers is seen and celebrated in “Zinzinnati” from her architecture and breweries to the Oktoberfest celebrations that take place all over the Greater Cincinnati and Northern Kentucky area. 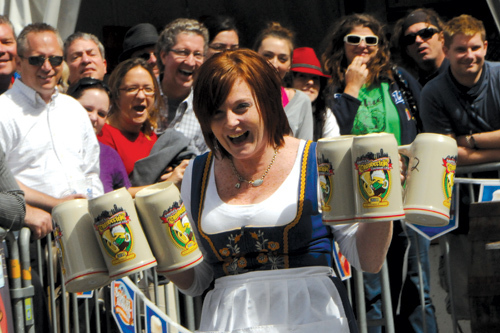 The neighbor cities of Cincinnati, Covington and Newport all have Oktoberfest celebrations as well as several communities including the Cincinnati Donauschwaben Society and the Germania Society of Cincinnati. Where: On six blocks of Fifth Street, from Vine Street to Sentinel in Downtown Cincinnati. Parking: Convenient parking can be found in the Fountain Square Garage for only $5. Parking info.